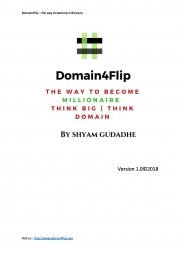 Description of "Domain4flip - the way to become millionaire (eBook)"
I am shyam gudadhe, wordpress developer, blogger, domain flipper,domain expert and husband,father, son and Indian. My aim is to everyone know about the domain flipping buying – selling business and to know become millionaire to flip domain name. Reviews of "Domain4flip - the way to become millionaire (eBook)"